The ABT mixed rep bill Thursday was nicely diversified with a Balanchine classic (Theme and Variations), an Ashton story ballet (A Month in the Country), and a new Ratmansky work (Piano Concerto #1). Ashton’s “A Month in the Country,” had its ABT debut in May 2013 at the Met. According to John Gruen’s “The World’s Great Ballets,” Ashton retired as director and chief choreographer of The Royal Ballet in 1970 and withdrew from public view. However, in 1975, he announced that he would choreograph a ballet inspired by Ivan Turgenev’s play by the same name with music by Chopin. The work debuted in 1976 with Lynn Seymour and Anthony Dowell as leads. The work "...is another example of Ashton's ability to convey a complex dramatic narrative through seamless choreography, without sacrificing any of the original's insightful characterizations, wit, and passion," according to Gruen. The curtain opens revealing the spectacular interior of the Yslaev’s summer home in the 1850s. The scene reveals a carefree day of leisure in the wealthy Yslaev household as the family is engaged in mundane household activities. Yslaev’s wife Natalia Petrovna (Julie Kent) reclines on a sofa with her admirer Rakitin (Grant DeLong) seated on a nearby bench; Kolia (Daniil Simkin), a young son of Yslaev and Natalia, works on his homework while Yslaev (Victor Barbee) sits on a chair reading a newspaper. Vera (Gemma Bond), the Yslaevs’ adolescent ward, plays the piano. Yslaev doesn’t seem bothered by the presence of a fawning admirer of his wife. Tiring of her piano practice, Gemma dances an impetuous, spunky solo filled with youthful energy. Gemma is from England and danced at The Royal Ballet until moving to ABT in 2008. Daniil follows with a spectacular solo while playing with a ball, filled with energetic pirouettes with very wide arms followed by a massive double tour that fills a lot of space with his wide arm carriage. Daniil was very good in playing this immature youth. Beliaev (Guillaume Côté, guest artist from the National Ballet of Canada), Kolia’s tutor, enters during his solo. Vera quickly takes notice of this handsome man as Natalia affectionately greets him. Beliaev is a debonair cad and all of the women fall for him: Katia a maid (Stella Abrera), Natalia, and Vera. First up is Vera, who dances a tender pas de deux with him as Natalia walks in and discovers them. Upset, Natalia slaps Vera, and then regrets her aggressive action. As Natalia and Vera leave, Katia discovers Beliaev and the two dance together. Katia has clearly fallen for him. However, Beliaev loves Natalia. Later in the work, Natalia and Beliaev are alone and embrace. Vera enters and catches them in their romantic pose (apparently the Yslaev’s don’t have locks on their doors) and attempts to extract revenge by calling everyone into the room. Rakitin tells the two lovers that they have caused enough trouble and should leave. Beliaev departs and then comes back to say goodbye. Natalia is sad; recognizing her agony, he decides not to create more anguish and quietly walks away, unnoticed by her. The work ends with Natalia kissing a rose that was pinned to Beliaev’s jacket as the curtain falls. Gemma Bond demonstrated her dramatic versatility, ranging from a sweet young girl to a star-crossed lover, to a bitter, spurned women seeking revenge. 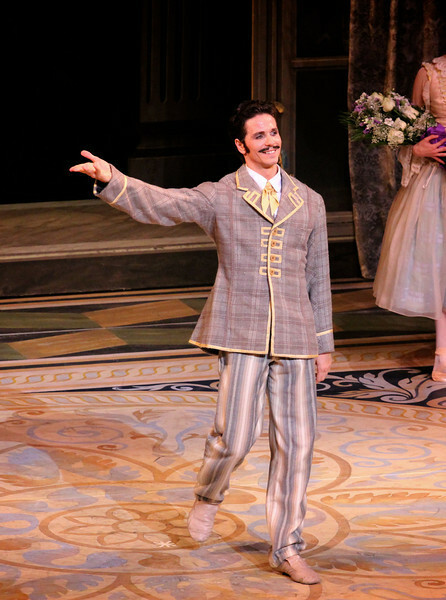 As Beliaev, Côté has the looks and gravitas to pull of this role of super cad. He had several slow pensive introspective solos filed with plush assembles, arabesques, and pique turns that were well done. Julie Kent excels at these dramatic roles and demonstrated her attraction for Beliaev, rage at Vera, and ultimate loss through her dancing. Piano Concerto #1 is my favorite of the three pieces in Shostakovich Trilogy by Alexi Ratmansky that premiered in May 2013. The leads Thursday were Gillian Murphy/Calvin Royal III and Skylar Brandt/Gabe Stone Shayer. Another example of young dancers getting a chance to perform lead roles as all are members of the Corps except for Gillian. The dancers' bodies are clearly on display as the males wear unitards (costumes by Keso Deeker) with the women wearing red leotards. The scenery consists of red objects hung in suspension against a blue backdrop, reminiscent of the hammer and sickle and other Soviet imagery. There is plenty of non-stop action in this athletic, high-energy piece with the four main dancers appearing in various combinations. Gillian and Skylar danced well together; I was very impressed with Skylar and her rapid, powerful turns. She is small in stature, similar to Principal Dancer Xiomara Reyes. Skylar had a grande jete diagonal section in which she seemed to fly, similar to Natalia Osipova, who performed the role in the spring season. I look forward to seeing more of Skyler, the recipient of a 2013 Princess Grace Award. Gillian was, as usual, very solid. Ratmansky gives the men a workout and Royal and Shayer were up to the task. Royal is tall and lean, and covers a lot of ground with ease while Shayer’s more compact build facilitates his rapid, aggressive turns. I particularly liked their nice double assemble diagonal. However, both need to work on landings, as several were sloppy with large hops after landing. Polina Semionova and Cory Stearns opened the show with Theme and Variations. I saw them in this role last week and thought that Cory was more energetic in this performance. Polina’s solos were outstanding, demonstrating great control in this difficult up-tempo piece, similar to last week. However, I thought their partnering section was better last week as they were not as in synch Thursday.